Here’s the deal…If you are thinking about ordering a new factory match replacement leather seat cover for your 2002 Cadillac Escalade, this is a very important thing to keep in mind. GM used 2 different stitching patterns in the 2002 model. One was used early on in the 02 production, and then it was switched to a different one that was used for the remainder of this year model. 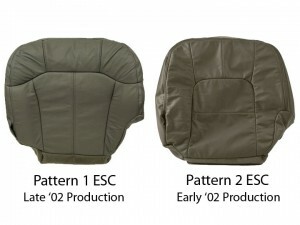 The later production seat cover (shown on the left) is more common to see than the early production cover (shown on the right). However, it is important to know exactly which one you have before ordering new leather seat covers. Both stitching patterns came with perforated leather inserts, and were available in either Shale “tan”, or Pewter “Grey.” If you have any questions about the 2002 Cadillac Escalade replacement leather seat covers, or any other leather seat covers from The Seat Shop, please feel free to give us a call at 214-710-2565. We would be happy to answer any questions you have.